Liver disease is the fifth biggest killer in the UK and, according to the British Liver Trust, the only major cause of death still increasing year on year. Liver disease is the fifth biggest killer in the UK and, according to the British Liver Trust, the only major cause of death still increasing year on year. NHS Choices says there are more than 100 different types of liver disease affecting at least two million people in the UK at any one time. In September, the RCN published a competence framework for nursing staff who are caring for people with liver disease. The framework is based around nine liver care competencies, including: undertaking a comprehensive clinical assessment; developing a self-management plan with the patient; and using early warning tools to identify a patient’s changing and deteriorating condition. The aim is to help equip nursing staff to identify those at risk of liver disease, promote healthy livers and lifestyle, and care for people with existing liver disease. 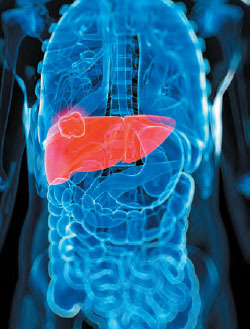 Sometimes referred to as the ‘silent killer’, liver disease often has only vague symptoms until damage is quite severe, says the British Liver Trust. Early symptoms may include feeling generally unwell or tired, having poor appetite, weight loss, a tender abdomen, feeling itchy or vomiting. Most people with liver disease only find out during tests for an unrelated illness or a medical check-up. When liver damage is quite severe, people can experience jaundice, bleeding problems, drowsiness and confusion, fever, swollen abdomen and legs, and tarry black stools or vomiting blood. Three of the main causes of liver disease are alcohol misuse, viral hepatitis and obesity, leading to non-alcoholic fatty liver disease. Being overweight, being female, having a pre-existing liver condition such as hepatitis C, and family history may increase the risks of developing alcohol-related liver disease. Nurses are integral to making an impact on the prevalence of liver disease and are key to its prevention, says the RCN. Nurses in every area of clinical practice can identify those at risk of the three major types of liver disease, helping them to make informed choices through health promotion and education. It is also important to signpost patients to support services. ‘The framework is important for all nurses, from practice nurses to those working in specialised clinics. Liver disease is now the third highest cause of premature mortality and age is no barrier, so raising awareness of risk factors is essential.